As low as $119.99 per oz over spot! The American Platinum Eagle is one of the four coins available in the American Eagle Series from the United States Mint. 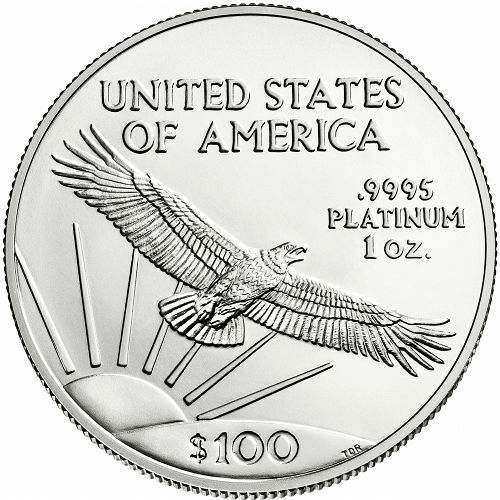 Introduced in 1997, the Platinum Eagle was the newest addition to the series until the 2017 introduction of a brand-new Palladium Eagle. The 2018 1 oz American Platinum Eagle Coin is now available to you for purchase online from JM Bullion. Arrives in a protective plastic flip, mint tube of 20 coins, or Monster Box of 100 coins! 16th issue of the American Platinum Eagle bullion coin! Contains 1 Troy oz of .9995 pure platinum in BU condition. Issued a face value of $100 (USD) by the United States. Obverse includes the image of Liberty created by John Mercanti. Reverse features the eagle soaring over America by Thomas D. Rogers. Among the four coins that make up the American Eagle Series from the United States Mint, the American Platinum Eagle is arguably the most intriguing. While all of the coins are available in bullion and proof versions, it is the design elements of the proof version in the Platinum Eagle Series that is worthy of note. While these American Platinum Eagle bullion coins have the same obverse and reverse designs each year, the reverse side of Proof Platinum Eagles is changed each year to feature a new design element focusing on either Liberty or the bald eagle. This makes the Platinum Eagle the only bullion coin from the United States Mint to alternate designs. 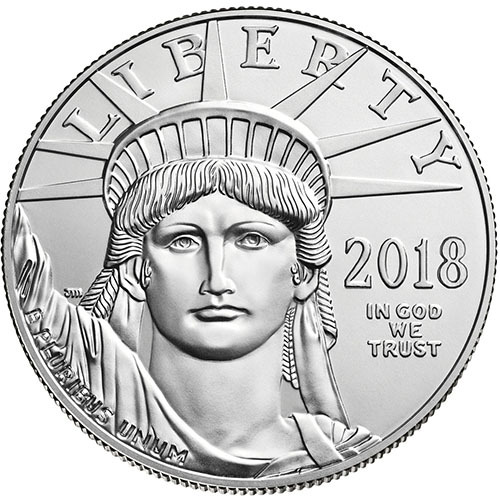 On the obverse of these 2018 1 oz American Platinum Eagle Coins youll find the image of Liberty. This effigy of Liberty is based upon the Statue of Liberty and focuses solely on her face. The solemn appearance of Liberty captured here was created by John Mercanti, former Chief Engraver of the United States Mint from 2006 until his retirement in 2010. The reverse of the American Platinum Eagle bullion coin includes the design known as eagle soaring above America. It captures a bald eagle in flight, wings spread wide, as it glides over the United States with the sun rising in the background. Created in 1997 by Thomas D. Rogers, a former artist with the US Mint, this is the only design to ever appear on both the bullion and proof versions of the Platinum Eagle. It is the annual design on the reverse of the bullion coin, and appeared as the first proof design in 1997 only. Your 2018 1 oz American Platinum Eagle Coin available here today is in BU condition. Coins in BU condition have no visible signs of wear and tear, but you may notice minor flaws such as breaks in the luster, spotted surfaces, or contact marks. These coins are available in individual protective flips, mint tubes of 20 coins, or Monster Boxes of 100 coins (5 tubes of 20 coins). We encourage JM Bullion customers to contact us with questions at 800-276-6508. You can also reach out to us online through our live chat and email address.
" Very nice looking coin, excellent transaction A "
"Very nice looking coin, excellent transaction A "